Jong-soo (Yoo Ah-in) toils at day jobs as he dreams of writing his first novel. 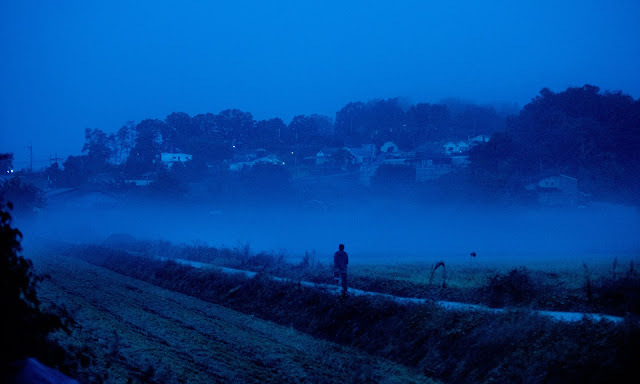 Just as he moves back to his family's farmhouse in Paju, after his father gets in trouble with the law, he meets Hae-mi (Jeon Jong-seo) by chance, a girl he used to know in his neighborhood. Jong-soo falls for the flighty yet mysterious Hae-mi, who asks him to take care of her cat while she visits North Africa. She later returns with Ben (Steven Yeun), an affluent Seoulite whose source of wealth is a mystery. Before long, Ben decides to share his secret hobby with Jong-soo. Lee remains true to the essence of his source material but along with blowing up a few pages of text into a sprawling 150-minute slow burn, he also explores a more complicated set of themes, some of which are uniquely tied to the film's Korean setting. Social class remains a major focus of the story but it's application here is far stronger, with urban and agricultural spaces sharply contrasting with each other. The film also suggests how little the haves of Korean society value the lives of others. Around Ben's friends, Hae-mi is more of a plaything than a peer, as she serves as their evening's entertainment. Then there's Jong-soo's house, with its South Korean flag on a mast flapping in the wind, and its proximity to the North Korean border, where loudspeakers drown the air with propaganda. Negatives perceptions of China also slip into a script that seems to question the hypocrisies that surround issues of national identity. With few characters on screen and little in the way of narrative throughout its early stages, some may find Burning slow going at first, particularly as its core requires effort to unlock. Yet the returns are manifold for those that invest themselves in the film. The deliberately paced first half winds to a stunning conclusion when Hae-mi and Ben drop in on Jong-soo at his farm unannounced. The trio drink, chat and giggle as they watch the sunset, until Hae-mi performs a dance of such emotional intensity that the chasm it leaves when she goes to lie down can only be filled with the deepest of secrets as Ben and Jong-soo begin to share theirs with one another. The orange glow of sunset having made way for the teal of dusk, Hae-mi and Ben tear off in his Porsche, inundating Jong-soo's face with the crimson of its tail lights. This extraordinary sequence is the sum of three great performances and Lee's masterful writing, but of equal note is the stark use of colors and the dreamlike handheld camerawork by director of photography Hong Kyung-pyo. Already a legend for his work on Bong Joon-ho's Mother and Snowpiercer and Na Hong-jin's The Wailing, Hong's contribution to Burning, which is easily Lee's most exquisitely designed film, is hard to measure. Returning to Cannes a year after he appeared in Bong Joon-ho's Okja, 'The Walking Dead' alumni Steven Yeun is perfectly cast as the arrogant Ben, who blithely toys with the people around him. As a prominent Korean-American, though his character isn't one, Yeun embodies a sense of otherness (partly down to the global intonation of his almost perfect Korean) that may be especially effective for local viewers. Though not picking up on this element in no way diminishes the impact of the malevolence Yeun hints at with his cocky grins, effortless swagger and the way he views himself as a balancing force in nature. Even more impressive is Yoo Ah-in, who is most well known in the west for playing the slimy son of a corporate head who serves as the villain in Ryoo Seung-wan's Veteran. Never better, Yoo embodies a sense of confusion, which eventually turns to dread in a performance that doesn't allow us to make any easy judgments about his character. Jong-soo's intentions throughout the story may seem innocent, but coupled with references to emasculation and his timid physicality, Yoo crafts an unusually compelling lead. Plucked from auditions, first-timer Jeon Jong-seo achieves something almost unthinkable for a rookie, as she embodies a character who is caught between her dreams and reality, her yearning for freedom and role in society, and the powerful desires of those around her and her own. She is magnetic every time she appears on screen, at once playful and aching with a longing for something that she may never understand. Artfully and tensely bound together by a master that has continually surpassed himself these last 20 years, Lee Chang-dong's Burning is a thriller like no other you'll see this year. Repeat viewings of this smouldering tale of glorious complexity will surely yield ample rewards.